Persona 3: Dancing in Moonlight and Persona 5: Dancing in Starlight are two sides of the same cassette tape. While their tracklists differ and their UI matches their respective games, beyond that, the structure is all the same. There's 25 songs to tap along to in each game, a plethora of items and outfits to don the characters with (the accessories largely returning from Persona 4: Dancing All Night, its predecessor from 2015 that capitalized on the Persona 4 gravy train), and some lighthearted interactions between the returning characters you already know and love. While in style and sound the latest entries of the rhythm game spin-offs of the Shin Megami Tensei: Persona series differ, in every other way they're parallel—Persona 3 is the A-Side to Persona 5's B-Side. Building off of Persona 4: Dancing All Night (which is making its PS4 debut in the Persona Dancing: Endless Night Collection of all three games), they serve as another excuse for the lively music of the JRPG series to be celebrated once again. It's a worthwhile celebration too, as Shoji Meguro's soundtracks are some of the most memorable of any RPG series in the past couple decades. 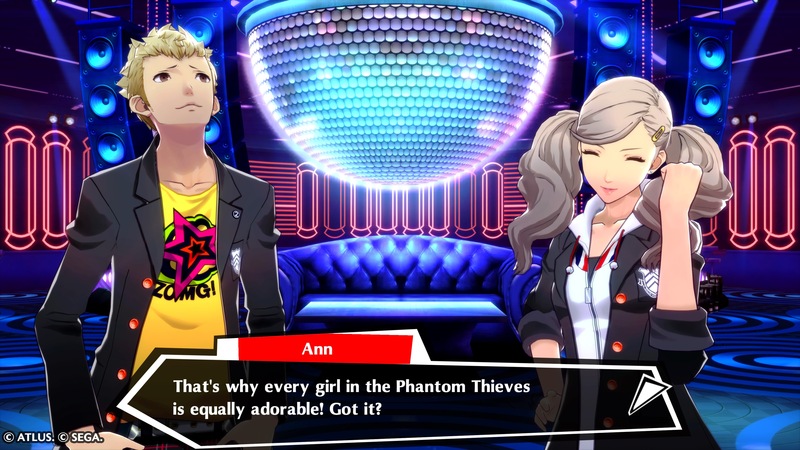 It's made better by the fact that each Persona entry has its own flavor; for each to get its own rhythm game—my condolences to the oft-forgotten first three Persona games—was always inevitable from the moment Persona 4's Rise recruited her teenage detective friends to be her backup dancers on the eve of more nefarious Shadow business. Shigenori Soejima returns for some ultra cute character art, seen in victory screens. Persona 3's music feels the most primed of all three Personas for its own rhythm game because of its soundtrack's natural toe-tappable nature. Its offerings are also spread across its three versions: Persona 3, Persona 3 FES, and Persona 3 Portable. Portable, in particular, gets a lot of love in the tracklist, which makes the roster's absence of the female protagonist felt even more. As rhythm game-ready as its soundtrack already was, in Dancing in Moonlight's sunny context it often feels at odds with the base game's dark themes of mortality—especially when characters playfully point a finger gun at their own heads instead of the pistol-shaped Evokers from battle. Persona 5's tone in contrast feels a lot more at home, considering its cast's largely bubbly personalities and costume wearing theatrics. Meguro's always had one hand in shaping the Shin Megami Tensei series, from directing the PSP ports of the first few Personas to moving onto a composer role once Katsura Hashino stepped in with Persona 3 and reinvented the subseries entirely. Here, Meguro's music once again gets the focus, with his signature tracks standing both alone and remixed by Japanese producers, such as Hideki Naganuma (of Jet Set Radio fame) and Tofubeats. 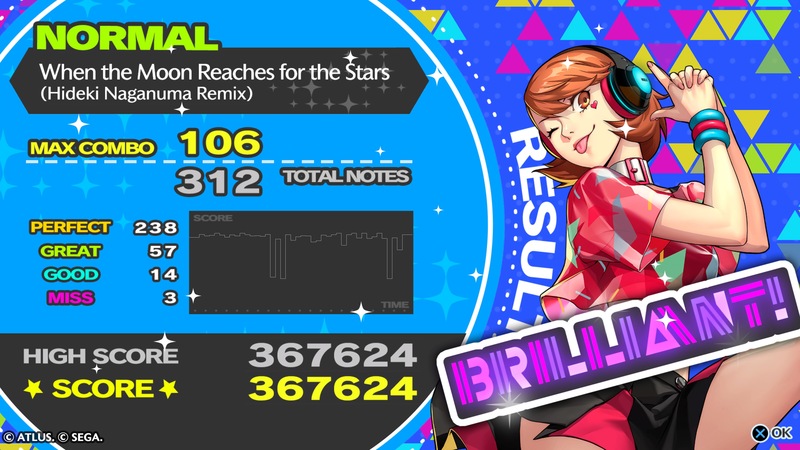 The remixes, as they were in Persona 4: Dancing All Night, are largely hit or miss, but Persona 3: Dancing in Moonlight gets the share of better remixes than its counterpart. The Dancing sub-subseries has had one glaring problem since Dancing All Night though: the rhythm game part has never been great. It's serviceable, but not much else. 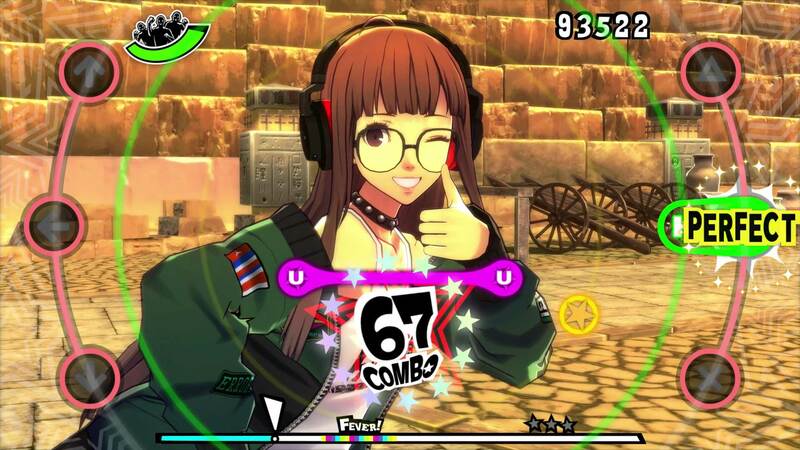 To best enjoy the truly silly dance choreography and the familiar stages (which range from Palaces in Persona 5 to the Tartarus in Persona 3), there are modes where you can kick back and watch with no obtrusive UI, or even in a fully Perfect run if you want to be jealous of a computer playing. On a television, especially a sizable one, it's easy to get cross-eyed while playing some of the faster tempo songs and higher difficulties. In the dozen-plus hours I spent playing through both games' tracklists on the PS4 (including repeating songs to unlock more Social events, which unlock after meeting certain requirements), I found myself wishing I was playing it on a smaller device. On the big screen, everything's so spread out that it's hard to follow sometimes, which culminates into one big headache. 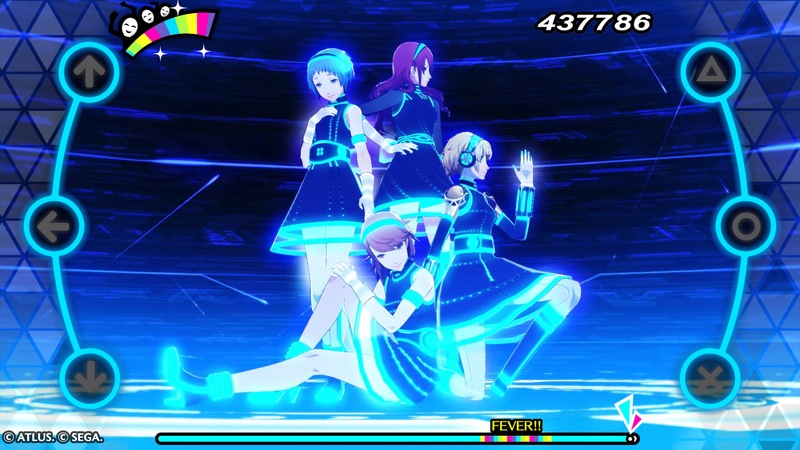 In lieu of Persona 4: Dancing All Night's sorta-sequel visual novel that acted as its story mode, Persona 3: Dancing in Moonlight and Persona 5: Dancing in Starlight instead get pared down social elements in its place. The visual novel-y parts instead feel like Social Links or Confidants from the games they're based from: bite-sized social interactions with your pals, except it's only the non-consequential moments from them. 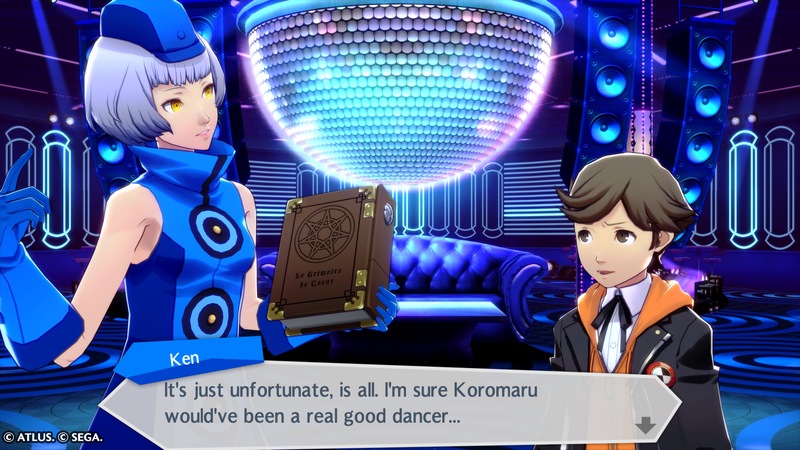 You get scenes like Ken from Persona 3 missing the notably absent Koromaru, or Futaba from Persona 5 gushing about her favorite idols, but nothing quite matches the mystery that was at the center of Dancing All Night's story. It lacks even the heartwarming moments of what Dancing All Night had, such as Nanako dancing to the Junes theme. What we get in its place is Ryuji from Persona 5 knowing how to whip and nae nae. The Social event scenes, which contain a handful of dialogue options and either one or two characters facing you, usually revolve around the loose set-up as to why you're all there: you're in a dream, preparing for a ball in the series-constant Velvet Room. Because of this, when you meet up with your pals, you're practicing dancing and talking about dancing at some capacity. With this being a non-canon spin-off, allegedly when everyone wakes up, no one will remember anything. All screenshots are taken natively by reviewer on PlayStation 4 Pro, except for this last one with Futaba, which is an official screen. The result is a rhythm game that's reserved for only the most diehard Persona fans, and not anyone really beyond that. The rhythm game is adequate as it was in its predecessor, but it doesn't work well when translated to televisions. Even with its faults, with customizable outfits and accessories, lots of modifiers to make songs either easier or harder (I always had a few challenge modifiers on, such as counting missing the record scratches as a miss, whereas by default it's not necessary and only adds to your score), and eight social events per character, there's still lots to work towards for the dedicated players who won't tire of dancing along to the funky bass of "Life Goes On." Both games end up feeling like no frills, no nonsense rhythm games. Where no story is needed; just the music and all your favorite characters from Persona 3 and Persona 5 talking about dancing. If the rhythm game were better, this wouldn't be an issue, but it remains feeling bare when stacked up against others in the genre—especially with its slim tracklist. Its minimal Social Link-like scenes are a fine replacement for a proper story mode, but the fluffy context of them lacks the endearing quality that even its predecessor had. In stripping away what made Dancing All Night unique, Dancing in Moonlight and Dancing in Starlight are just left with a couple dozen excellent songs to hum too, goofy costumes, some charms, but not much else to harmonize with in the moment to moment. For that, they're games reserved for the fans with their dancing shoes already strapped on and the breakdown of "Burn My Dread" from Persona 3 set as their morning alarm, since it's doubtful rhythm game aficionados or casual players will get much out of it. Tagged with Atlus,	persona,	persona 3,	Persona 3: Dancing in Moonlight,	Persona 4: Dancing All Night,	Persona 5: Dancing in Starlight,	Persona Dancing: Endless Night Collection,	Reviews.